Parking is on Roadbase, compacted. 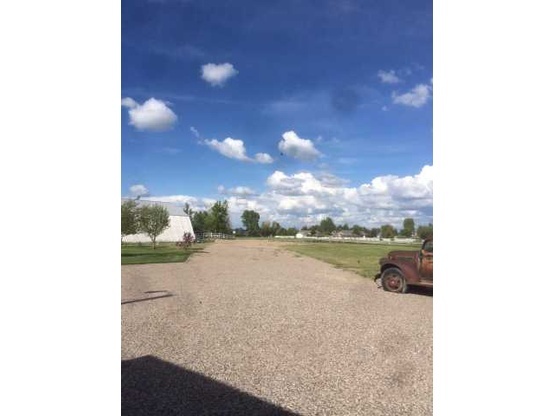 Quiet country setting on two acres, adequate privacy and parking, with a fantastic view. Close to large cities, the Potato Museum, Craters of the Moon National Park, Lava Hot Springs, it is a 3 hour trip to Yellowstone National Park or Grand Teton National Park so we are on the way. Dogs Must be on a leash. We like to visit and be sociable, so get your stories ready. We also enjoy a cocktail or two. If there are more guests/pets than in your profile please let us know. Dogs must be kept on a leash, if your dog(s), of any size pursues or attempts to chase our cat, it will be an immediate invitation for you to leave. As a courtesy to others please do not intend to arrive after dark. All roads are paved. There are sharp curves for Combined RV's over 75'. The first mile or so is fairly bumpy. Trees/Wires will not affect rigs under 14-15' tall. Generally somewhere close to your rig, but there is plenty of space. We are not available during the winter months, and no water services if it is still freezing at night. Please do not intend to arrive after dark. The Potato Museum, Craters of the Moon National Park, Lava Hot Springs, and a lot more including a short 3 hour trip to Yellowstone National Park or Grand Teton National Park. 2+ hours from Shoshone Falls and Shoshone Ice Caves, 45 minutes form the American Falls Dam with Awesome views and fishing. Close to shopping and a great public golf course. Great Stop on our way to West Yellowstone! Wonderful site and hosts! Easy pull through on gravel and 50 amps!!! Enjoyed sharing stories with the Alstons. We had a great overnight stay. We enjoyed a nice conversation on the deck under the stars and were even offered water and electricity hook up. We had a very enjoyable time with the hosts. The property is absolutely gorgeous. They have a very easy spot to park and is right next to water and power. We had recently had some transmission trouble and needed to switch out the fluid. They graciously offered to help and let us use the shop to get it done. We are so thankful and definitely have made some new good friends. These two lovely people took an e-mail from us early on a Sunday morning and gave us the green light to be there in the afternoon. Great place to park, great people to meet, great town to do some chores in. Thanks for everything you guys, it was a real pleasure to have met you. Great hosts, good hookups if needed, beautiful area. 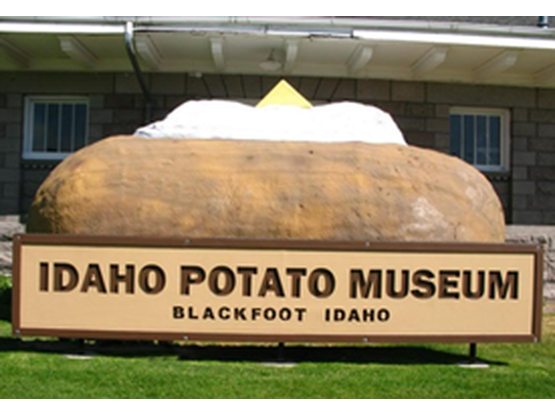 Be sure to check out the Potato Museum. It's quite interesting. And only an hour from Lava Hot Springs; a must if you're in the area. Hope to see these folks again in the future. Home shows all your hard work very nice and thank you for being a host. wonderful location! Had such a great time we extended an extra day! Stef and Neil are fascinating hosts! And the apples are pretty good too! Thanks so much for having us! Neil and Stephanie were the BEST hosts! Not only do they have a great place to stay, but they truly extend outstanding hospitality. I enjoyed getting to know them and Neil makes a great steak! If I am ever close by, I hope to stop in again. I hope that they would do the same if they are ever nearby! Thanks Neil and Stephanie! Great site and wonderful hosts! Neil and Stephanie are super hosts! We appreciated the thoughtful parking location with elec. hookup and protected from the wind. They offered us apples from their abundant trees and organized a potluck dinner with their other BW guests. Thank you for a lovely visit! It was a privilege to have met and shared time with this wonderful, friendly couple. We have fond memories of our short visit. We wish them the very best of luck with their grand future plans, and hope to have the opportunity to return the favor and host them one day! Thanks again for everything! Excellent hosts,had great time at there place. We will cherish the time we shared. Wow is all I can say about our stay with Neil and Stephanie. The location and space for our 5th wheel was just perfect and our hosts couldn’t have been nicer. We spent hours outside getting to know them and swapping stories over some nice wine and great company. This was our first experience with BW and we thank you guys so much for the awesome hospitality and making our first AWESOME....hope to see you in Lake Havasu!! Alston’s Acres are the best hosts. They certainly made us feel more than welcome. They have a world map with a pin in every city that indicates a boondockers home if they’ve stayed at Alstons Acres. LOTS of pins in that map! When we’re back their way again we hope they’ll have Ron for us. Thanks for your hospitality! We really enjoyed being able to have dinner and visiting with you. Such a great spot you have there, loved it! All Fabulous comments from other boondocks are absolutely true. Two of the best people on the planet. Wonderful fun time again on our second stay. Love you guys, we are your biggest cheerleaders! 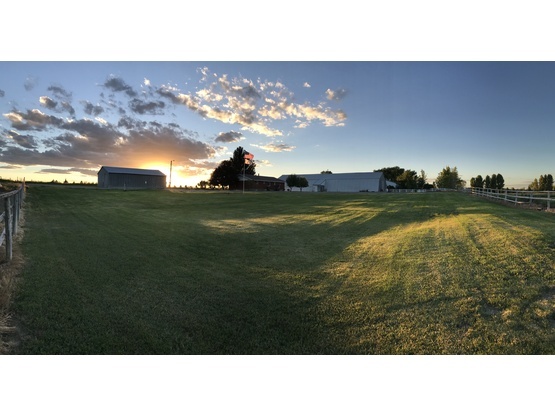 AlstonAcres is a wonderful spot for visiting the central Idaho area. The host are very accommodating and love to have visitors. We really enjoyed sitting and talking with them in the evenings. There are several nearby attractions and the farming community is something we really enjoyed seeing, Will definitely try and stop here again whenever we're in the area. We spent 3 nights with Neil and Stephanie and enjoyed dinner with them daily. They were like being with family. We will definitely stop back by on our future travels! After traveling so long with kiddos, it was nice to get a chance to sit down and visit with "grown ups". They were very welcoming and the location was SO convenient! Couldn't ask for more!!! Really enjoyed our stay, this couple are really fun. Loved the toy's and the cats. Hope you will let us stay again in the future. Super accommodating hosts ! AlstonAcres have a wonderful home and have put tremendous effort in preparing a great place to Boondock. Great experience and would love to visit them again. Beautiful place! Quiet, serene, bucolic. We woke up to the sound of killdeer and later robins. Great fun loving hosts who extended their dinner invitation to include us. Very gracious and warm people with bee-you-tee-full cats! Thanks for a great evening of laughter! We hope our paths cross again! Came as strangers, left as friends! What a wonderful stay. Not only is the location peaceful with a lovely mountain view, but our hosts were very knowledgeable about things to see in the area...so much so that we asked to extend our original stay request!! Had a great time, and feel fortunate to have had the chance to get to know these great people. Would love to stay again! You pull in as strangers and you leave as family. Whatever you need, they do their best to provide. The setting is beautiful, quiet and relaxing. They include you in everything from potlucks to dinners out and giving grand tours of the area. We can’t say enough positive things about them! They were our second Boondockers Welcome experience and I just can’t imagine anyone topping them. They have set the bar high. We hated to leave, but we will see them again and stay in touch! My family and I stayed at Alston Acres for three nights in June and our stay couldn't have been better. Our hosts met us in the driveway and showed us the spot for our rig even offering electric and water hookups. They gave us time to settle and then invited us for dinner on the patio with the other boondockers that were staying with them. Our boys helped with some landscaping and our daughter gave the cat lots of love. We were already like family. We did leave to do some exploring at Craters of the Moon and the Potato Factory. Fun places to visit! We loved our nights in fellowship with our new friends and can't say enough about their hospitality. We will definitely come back to visit when traveling Idaho and we hope our hosts come to MN sometime. We are so grateful for this stop on our trip and for meeting our Boondockers Welcome hosts and other guests. We enjoyed the green season on Blackfoot. The hosts were very knowledgeable about all the local communities. I appreciated all the technical advice Neil gave about living full time in an RV. I wish we planned to stay longer! Great people and beautiful place. A tekie like me.....So we got along great. Had a nice dinner and took off in the morning. Thank you all for another great Boondocking experience. Since this was our first time using Boondockers Welcome, we really didn’t know what to expect, but based on their previous reviews thought it would be a good place to stay. We arrived and immediately Stephanie came out and greeted us. Then, Neil came out and helped us to determine where to park our motorhome. Even had a couple of options for 50AMP electric! We had so much fun, from, delicious meals shared (totally did not expect this), picking asparagus, card games, a tour of the dam and surrounding area, and lots of laughs. Met some of their aunts and uncles that were visiting and everyone just made us feel like family. Even had some other Boondockers there too, who were great people. Stephanie and Neil are so warm and generous, and a wealth of knowledge. We hope to come back to see more of your beautiful state and you, or catch up with you on the road somewhere. Thank you from the bottom of our hearts for welcoming us into your lives for a short time. You’re the best! PS. Mama tried to climb the steps into our MH as we were getting ready to leave. I guess she had room for two more friends! LOL. We certainly have room for you (and the kitties)! You could say the Moon and the Stars brought us to stay with AlstonAcres, and that would certainly be the truth. You see, we stayed with AlstonAcres last year for the solar eclipse. Several other Boondockers Welcome guests were here at that time. It was like a Boondocker’s Welcome Convention. --- We were elated to find out that our travel plans for 2018 would bring us by their place again. It was so good to see them. It was like Homecoming for us. A big bonus was getting to met some of their out of state family that was in town for a visit. -- You will always feel welcome and at home when you stay here. They are amazingly generous with their time, and they have an amazing place to host Boondockers Welcome guests. Our hope is that they will be able to visit us someday in Georgia. Till then we will leave here once again with smiles and a head full of wonderful memories that were made here at AlstonAcres. We thoroughly enjoyed our stay at Alston Acres. Our hosts greeted us and treated us like old friends. The country setting was so peaceful and serene. Just wish our schedule would have allowed us to stay one more night. Awesome visit. Would definitely stay here again. Great visit with terrific hosts! Loved our visit with Neil and Stephanie. Highly recommend Smokin Pig BBQ where we enjoyed dinner with them. Thoroughly enjoyed visiting and stargazing -great Boondocking spot! Can’t wait to visit again! Wonderful, wonderful, wonderful. Did I say wonderful? Well let me say it once more in case you missed it. Simply a WONDERFUL stay. Neil and Stephanie are absolutely wonderful people. We can't say enough about them. Gracious and welcoming from the moment we arrived. We were able to go out to dinner twice with them. As well as spending time at the house and shop. Nice quiet country setting. Snow caps mountains in the distance. Easy shopping nearby. Including the Potato Museum. If you like potatoes, ya gotta go there. We are looking forward to coming back again someday. Or having these great folks come to our location. From the time we rolled up with our rv until we left, the welcome mat was out. Stephanie and Neil are super friendly and helpful people; we felt right at home at their place. There is plenty of space, and nice level gravel pad to set up. Our hosts helped us settle in the first evening and the following day included us in an afternoon of playing games and a potluck dinner. What fun! AlstonAcres are very gracious hosts. The location itself is a very easy in and out with access to their hookups. They shared their knowledge of the area with great recommendations for site seeing. They also hosted us for some boardgames, bbq, and socialization. It was an overall grand experience. Stephanie and Neil are really, and I mean really fantastic hosts. Great welcome, great place, lots of room to park but more importantly is the warmth of the welcome. Neil showed me around their property, we rent for dinner and shared experiences throughout the dinner time. I even had a special glimpse of their factory (not sure I am supposed to say). Will certainly go back on my next trip heading north or south. Stephanie and Neil, thanks again. We enjoyed our stay immensely. Had a great visit, shared stories, and went for pizza together. Definitely look forward to staying at Alston Acres again. Two thumbs up! We had a lovely time with AlstonAcres, they are generous, fun and just made us so welcome. Thank you from the Kiwis! Neil and Stefanie were legendary hosts ! They made us feel like old friend right from the start. Without them, we probably would have skipped most of Idaho and, instead, we visited a lot of it's features. We discovered so much with them, it's incredible ! Their boondocking spot is perfect and quiet, and Stef is a great cook. We hope to see them again in the future. Our new friends here at Alston Acres made us feel like long-time friends. They are fun, generous, and creative folks who were genuinely inviting. Their beautiful property is easy to access, yet private. We hope to host them sometime in the future! We cannot tell how much we loved spending the night with our hosts. Very nice couple with a lot of talent. The location is great as well, both made a great job to remodel their land. Hope we can meet again in the future. We stayed with these nice folks for only a quick overnight. As we came in a little after dark, they met us at the mailbox with a flashlight and a mosquito racket! (Though I must say I did not get any mosquito attacks). They were already hosting a couple other rigs, but found a place for us and a way to get electric to us. I harbored a little guilt because just 2 weeks ago, these same people had contacted me last minute for a night's stay that night, and I did not check my email. Words cannot describe the way you will be welcomed here with open arms. Alston Acres will go out of their way to make sure that you are comfortably set up and made to feel at home. We can promise you that your stay with them will be one of the highlights of your trip. You feel like you have known these wonderful people forever, and you are instantly friends for life. What a delight. Wonderfully warm people. And, they are very helpful with suggestions on things to do in the area. We were greeted as we pulled up, and they quickly helped us get backed in and set up. Everything was exactly as described, and they were very quick to return phone calls and emails. Very friendly hosts who take care of you like family. They have put together a great boondocking site in a very Nice location. We would not hesitate to return or have them at our place. AlstonAcres are fantabulous Boondockers Welcome host. We spent two nights at the Acres and really enjoyed it. They said we were welcome to stay another night or two but we needed to be on our way. You will probably not meet two nicer people in your life. We really enjoyed visiting with them and hope to make a return trip. Neil and Stefanie are incredible hosts. Their property is very quiet with lots of gravel and grass. Our hosts were entertaining and entertained us daily, and even allowed us an extended stay. We feel privileged to know them. Our stay included the day of the solar eclipse, and along with other boondockers who were present, a good time was had by all. We are thankful and appreciate our time spent with them and plan to meet up again in the future. They are the best! AlstonAcres was my first experience with BoondockersWelcome. Holy cow! I thought it would just be a place to park for a couple of days during the total solar eclipse, but it turned out to be SO MUCH MORE! Due to their proximity to the path of the eclipse, they were very popular and I was the fifth rig to pull in. They quickly got me settled and wired up a quick 30 amp plug for me so that I could get my AC going. I was then invited to the patio to share drinks and a taco bar with all the B-dockers. They helped me figure out the best eclipse viewing area and made the once of a life time experience even better! Thank you AlstonAcres for making my first experience with BoondockersWelcome an absolute 10!!! I hope to be back and catch up with the other Boondockers sometime soon. Our hosts were outstanding and went above and beyond in hosting us. They were able to tell us about the surrounding area and answer all our questions. There were several boondockers on there property for the solar eclipse at the time we were there. They were able to provide chairs and tables for us to share meals (semi pot luck, semi free style). There was lots of conversation and sharing of information of all kinds including RVing. We felt welcomed and part of a family. I look forward to the opportunity of staying with them again. It was a phenomenal experience! AlstonAcres are the nicest people you could wish to meet. So friendly, made us so welcome on their property and went out of their way to make us feel at home. Lovely evenings chatting away and suggestions given for trips out. Nice area. Miss them both and we would love to stay again next year! Alston Acres really went out of their way to make our one night stay with them very confortable. It was a very cold and windy night, so they let us and our baby daughter stay in their huge parking garage/ shed including an "outside" table plus chairs. Before we had a very good night sleep we spent some time chatting. Very nice and helpful couple. We really enjoyed our stay at Alston Acres! They are the nicest people you would ever want to meet. They went above and beyond to make our stay with them the best experience. He even hooked up a phone for us to use as a hot spot so we could use the internet on our computers. It was very helpful as most of the campgrounds we stayed at, the internet service was not accessible. I can not say enough good things about this couple! We spent two nights with two of the greatest people one can ever meet. Additionally, they were very accommodating regarding our beloved Black Lab who also thought they were great people. They were also kind enough to spend a full day showing us some of the great local sights. We are very hopeful that we will have opportunities in the future to see and spend time with them again. We received a warm welcome upon arrival and stayed one night. It was very easy to find and quiet in their country setting. We had a wonderful evening with Neil & Stephanie. They are a great couple with big hearts. We became friends very quickly and plan to remain friends in the future. Thanks again for everything! We had the best time boondocking with Alston acres. We were instant friends upon meeting. They are the most considerate and hospitable hosts, going above and beyond our expectations. We shared some great meals and conversation. The only problem is we couldn't stay longer. Highly recommend! We did make it to the potato museum in town, we got our 'taters for out of staters' there. And the lake in town is a nice spot to go swimming.